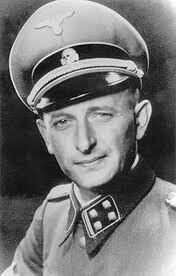 Adolph Eichmann worked closely with the notorious S.S. General Rienhard Heydrich, and helped formulate and institute the plans for the Final Solution. He escaped eventually to Argentina, but was kidnapped by the Mossad and taken back to Israel for trial. Eichmann Interrogated is comprised almost entirely of edited transcripts of conversations between Israeli Captain Avner Less and Eichmann himself. The book starts and continues on a tedious note. Eichmann takes pains to clarify the minutiae of who he knew, when he joined the S.S. and why, what his rank meant, and exactly what he did. Painstakingly he gets us to the point where he asserts that the scope of his powers extended to Section IV B4. That’s all. He even expresses horror at the fact that Nazi’s murdered Less’ father in a concentration camp. 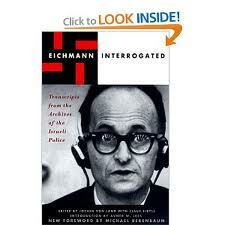 But around page 90 or so Less’ questions come more to the point, and Eichmann’s responses have to match. Eichmann claims responsibility only for the fact that he transported people to the camps, and not for any of the deaths. He talks of the need to obey orders, that he did nothing illegal as far as German law was concerned. When pressed on the death of civilians at the hands of Germany, he admits it but points out that the Allies killed hundreds of thousands of civilians with their bombings as well. He is deferential, but fights nonetheless. He desperately tries to get distance between himself and the victims by claiming that he did not know necessarily that any of them would be killed for sure, otherwise why did so many Jews survive the war? Bizarrely, he almost argued that his conscience could be clean because any of those he did ship to camps might hypothetically not be killed, thus, he can say he helped kill no one at all. He is very clear on this point. Eichmann does not come to terms with his actions. Many things make the last 150 pages or so of the book so memorable. Did he truly believe the legal fictions he spun for himself? Did he divorce himself so much from reality that he could not connect his transportation of people and their deaths? Surely too, he lied about the extent of his involvement. But again, did he believe his lies? Hannah Arendt’s work helps complete the picture. 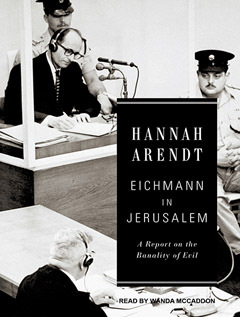 I thought Arendt’s Imperialism fantastic, but Eichmann in Jerusalem lacked the focus of that previous work. Still the subtitle itself (A Report on the Banality of Evil) is a great insight into the whole Nazi regime. Arendt does also draw one key conclusion about Eichmann himself. She did not see him as a simpleton or a mere patsy. He had a kind of intelligence. But she argued that Eichmann had no ability or training to see anything beyond the moment. 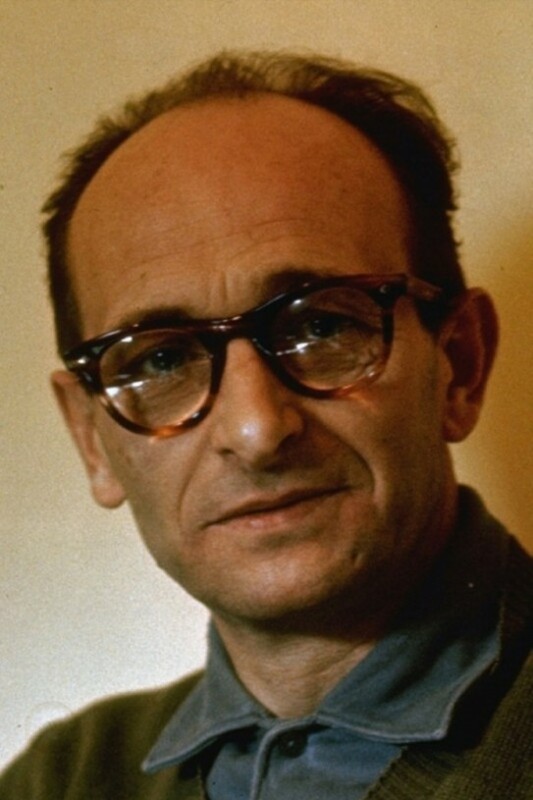 One example might be that within minutes of each other he first disavowed any believe in the afterlife and then proclaimed that, “Germany will live in my heart forever.” Eichmann was perhaps literally incapable of seeing the contradiction. The same insight applies to him expressing horror over Avner Less’ father in a death camp. Perhaps that too was not an act. Perhaps he did not see the connection between himself and that event, however absurd that notion is. Truly, he was never trained or encouraged to think or view things outside of himself. He accepted his death sentence passively, but with little real sense of the reasons why he deserved it. * For him the verdict seemed like victors justice and not Justice proper, a mere extension of the war 17 years later. If she is right in this about Eichmann, then we can reasonably assume that he may not have only tried to concoct a desperate defense with his, “I only shipped them to the camps, I never killed anyone,” line. He might have actually believed it. In this way Arendt makes us see that Eichmann is part of the tragedy of the Holocaust, all the more so because it seemed he couldn’t see that about himself. This week we wrapped up World War II by focusing on two key issues: our use of the atomic bomb, and the Nuremberg Trials. We discussed before how war in general can have a terrible kind of osmosis for the combatants. So in W.W. I the Germans first used chemical warfare and all cried foul, but soon the Allies followed suit. All were outraged when the Germans bombed London, but as the war went on the British and Americans killed far more civilians with their bombings than the Axis powers. Herman Goering called the conflict, “the great racial war,” and Americans as well as the British adopted some similar attitudes to their enemies as the Axis powers did to us. This proved especially towards our Japanese opponents. 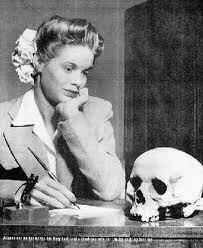 This picture, for example, of a young woman admiring the skull of a dead Japanese soldier her boyfriend sent her, appeared prominently in Life Magazine. 1. Is it the primary job of the commanding officer primarily to abide by a a Christian ethic of human life even if it puts his troops at relative disadvantage, or do we want him to instead seek to have his men accomplish their mission with as few casualties as possible? What about the President? It is worth noting that Air Force General Curtis LeMay, who led many of the bombing runs that killed hundreds of thousands of Japanese, thought that he would be tried as a war criminal should the Allies lose the war. The divide here may be seen this way. . .
On the one hand, you have the view that “war is hell,” and exists essentially outside normal ethical standards. Killing someone, for example, is never the “kind” thing to do. The main goal, therefore, is to end war as soon as possible, and then resume “normal” life. On the other, you have the view that war is not primarily about victory, but about our sanctification as individuals and as a nation. If fighting “morally” means we suffer, so be it. Just as individuals should never do wrong to benefit themselves, so nations should not either. Granted, this divide may be altogether too simplistic. but it touches on another issue. What are nations? When a nations acts should it be held to the same standards as individuals, or are nations in fact artificial, impersonal creations that therefore are not subject to the same standards as individuals? These questions have no easy answers. 2. Should the ethics of war depend in part on the nature of conflict itself? For example, conflicts in the past involved armies of aristocratic warriors, and rarely involved the general population. In the 20th century however, war between whole nations became the standard. If nations fight, can the whole nation, civilian or otherwise, become the target? I hope the students will consider some difficult questions. Is there a difference between bombing cities from the sky, and going from house to house shooting those inside? Can you target areas if civilians are likely to be unintended collateral damage? We wanted to avoid a mainland invasion of Japan, which would likely have cost us at least 100,000 casualties, with some estimates being much higher. We wanted to end the war before the Soviets could get involved and take Japan for themselves. While we could have bombed Hiroshima conventionally with a comparable destructive impact, the atomic weapon had much greater potential for psychologically impacting them. Our use of the two atomic weapons, “Fat Man,” and “Little Boy” did have the desired effect. Japan did surrender without us needing to invade. But nearly all Japanese that died in these attacks were civilians. For the first time in my teaching career, almost all of the students thought that the decision to use the bomb could not be justified. Germany’s surrender left us with a variety of post-war dilemmas. The magnitude of the evil perpetrated in the Holocaust numbs the mind. Never before in history had such a thing happened on such a scale. But what should we do with Nazi leaders that surrendered? Should they be released into civilian life again, as if nothing happened? Or should they be shot out of hand? Neither option seems to satisfy. Putting them on trial had many advantages to it. We would give them legal counsel. They would have a fair chance to prove their innocence or at least mitigate their guilt. This was the “civilized” option. But that too posed problems. What right did we have to put Germans on trial? They were not American citizens and had broken no American laws. To what kind of law can we hold them accountable? We can argue for international law, but the Germans had withdrawn from international agreements and oversight before the war began. Thus, they were not accountable directly to international laws they never pledged to obey. What legal procedures should even govern the trial? Furthermore, how could the trials be fair if all the judges were Allies? Should the Germans have the right to a trial of their peers? But would that eliminate the possibility of guilty verdicts? Could the trials be fair if the Soviets participated in the prosecutions? But how could we exclude them, considering that the Soviet Union suffered far, far more casualties than the U.S. and England combined? The trials raise many perplexing legal questions, but also difficult moral ones. How far should the “I was just following orders defense,” be allowed to go? How far down the chain of command should we prosecute? Eichmann served in the S.S. and played a role in the Holocaust. He ended up escaping from Germany, and was captured by Israeli’s 15 years after the end of the war and put on trial. Many remarked on how ordinary a man Eichmann was. Hannah Arendt’s famous phrase “the banality of evil” fit him perfectly. In his collection of folklore from Ireland W.B.Yeats quoted the Irish proverb that, Those who travel much have little faith.” He quoted this with seeming ambivalence, which reflects something of Yeats himself. He certainly had many markings of the worldly man, yet he wrote the magnificent poem “The Second Coming,” with the immortal line that tells of the centre no longer holding, the widening gyre of the falcon. I have traveled very little, but this very small amount of travel has confirmed its enormous educational benefits. One sees new things from new perspectives “in the flesh.” Certainly one should always wish to grow, learn, and so on, but the proverb holds at least a kernel of truth: those who travel without a secure base may find themselves more “enlightened,” but also more confused then before. These new perspectives can completely undo one’s world. Whether this disruption be good or bad . . . it is unquestionably a disruption. The great Gilbert Murray made his mark in the early 20th century as one of the great scholars of classical antiquity. For many he modeled the calm, rational confidence of pre-W.W. I Europe and the blessings of “free inquiry. His analysis of the history of Greek religion confirmed his rationalism. Greece turned to irrationalism, he argued, and therefore decline, only when they lost their “nerve,” their sense of themselves. the religious–and what is more–the ethical emotions of the English people are rooted in the Christian writings, especially the Gospels, some of the epistles, and books like the Imitation and Pilgrim’s Progress. The situation must be accepted. Murray saw the emancipatory movements of the 19th century and often supported them. But, he remained apparently torn about this in his later years, for he saw that the collapse of traditional Europe after W.W. I did not lead to more freedom as expected, but much less freedom for millions due to the rise of totalitarianism in Italy, Germany, and Russia. What are your thoughts on the rationality community? Well, tell me a little more what you mean. You mean Eliezer Yudkowsky? Yeah, I mean Less Wrong, Slate Star Codex, Julia Galef, Robin Hanson. Sometimes Bryan Caplan is grouped in here. The community of people who are frontloading ideas like signaling, cognitive biases, etc. Well, I enjoy all those sources, and I read them. That’s obviously a kind of endorsement. But I would approve of them much more if they called themselves the irrationality community. Because it is just another kind of religion. A different set of ethoses. And there’s nothing wrong with that, but the notion that this is, like, the true, objective vantage point I find highly objectionable. And that pops up in some of those people more than others. But I think it needs to be realized it’s an extremely culturally specific way of viewing the world, and that’s one of the main things travel can teach you. For example, the Pythagoreans developed a variety of useful and progressive ideas about math. But their obsession with ratio/rationalism clearly had strong religious overtones, which shows when they (supposedly) drowned the “heretic” Hipassus for discovering irrational numbers. The foundation of their mathematical advances had strong irrational overtones. Socrates, whom many assume to be an arch-rationalist, declared in the Phaedrus that, “Our greatest blessings come to us in the form of madness.” The whole of Greek literary and dramatic culture arose out of Dionysian worship. Xenophon, Aristotle, and even Cicero accepted the idea that dreams could have spiritual import. The list could continue. But as in the case of all civilizations, eventually elites, followed by others, began dismantling the irrational foundations. This sounds like the dream of many a modern man, but of course, no one could argue that Greek civilization had any large degree of health at this point. Very few, if any, of Greece’s storehouse of cultural contributions came from this era, and this era paved the way for their final takeover by Rome ca. 146 B.C. Once you ditch the conglomerate, you might have little less than sand on which to build. You simply have too many decisions to make and no way to make them coherently as a group. It seems to me that today we have two groups that argue strong for a rational, open society. On the conservative side we have those who believe in entirely unfettered markets and expanding choice. The best society is one where everyone can choose for themselves how to maximize their welfare. Empowered by education and multiplicity of options, the conglomerate of free choices will create a happy society. This group favors globalization, open borders, and so on. On the more liberal side we have those who emphasize the power of choice in more personal, intimate ways, especially in terms of gender and sexual identity, family makeup, birth control (which includes abortion), and so on. These two sides overlap at points. They often sit across the political aisle from each other, but they have much more in common than what divides them, for they share a common foundation of devotion to the idea of an open society described by Dodds. Other groups still believe in some way in the inherited conglomerate. You have the more conservative, middle-America, white picket fence group that adheres to small town values, and you have more liberal leaning who might balk at small town values a bit, but still desire a “decent America.” The more conservative side sees culture and community holding things together, the more liberal look to government with greater frequency to manage outcomes. Yet both sides fear markets and morality running wild and free–and both have more faith in America’s “conglomerate” than either of the aforementioned groups. Both could be described as irrational, for there is nothing objectively verifiable about “America.” Their commitment lies on a gut-level, formed by a variety of experiences, emotions, and so on. This looks like a clash between the rational and the irrational, but Dodds’ book helps illumine this divide. The irrational have an unprovable gut-level attachment to something called “America.” But the rational have something akin to religious commitments as well. Those devoted to the market and to personal identity need to believe that the expansion of choice ad infinitum is always a good thing. Neither party may believe much in “America,” or they may reduce America to the mere idea of choice. Their faith lies elsewhere, and they take on the missional mindset of some of the world’s universal religions. Our political divides often mask religious divides. As Cowen argued, even the rational have irrational commitments. *Murray’s daughter asserted that he came back to the Catholicism of his youth in the last weeks of his life, though other family members dispute this. **By “irrational” Dodds does not mean “wrong,” or “foolish” but unprovable, or a mysterious a priori, or “psychic,” i.e., related to the soul. This week we continued with W.W. II, and put a special focus on the impact a culture has on its army, and how that impacts the fighting itself. All of these qualities dovetail nicely with totalitarian societies. Examples abound of the extreme sacrifices of individual Japanese soldiers in W.W. II. They rarely surrendered. They threw themselves on top of barbed wire and let fellow soldiers climb on top of them. Surely any commander would prize these qualities. And yet, democracies have a very favorable historical record in war against totalitarian regimes. In fact, democracies get in much more trouble when they fight each other, i.e. The Peloponnesian War, The Roman Social War, World War I, etc. What values, then, do democracies give their armies, and how does this help them win? We looked at the Battle of Midway in June 1942 to help us understand this. Both Japanese and American armies had brave soldiers, but their actions were byproducts of their cultures, and the values of Japanese society put them at a relative disadvantage. Historians of all stripes universally agree that American military intelligence far outstripped Japans. Is this coincidence? Code breaking requires an extreme level of mathematical and analytic ability, and many people who possess that ability would not easily fit into a military lifestyle. The U.S. army let these code breakers work independently. Sometimes they showed up in uniform, sometimes they showed up in a bathrobe and slippers. Sometimes they worked 9-5, sometimes they worked 24 hrs. straight and then took the next day off. The U.S. tolerated all of their individual eccentricities, and it paid off with sterling results. 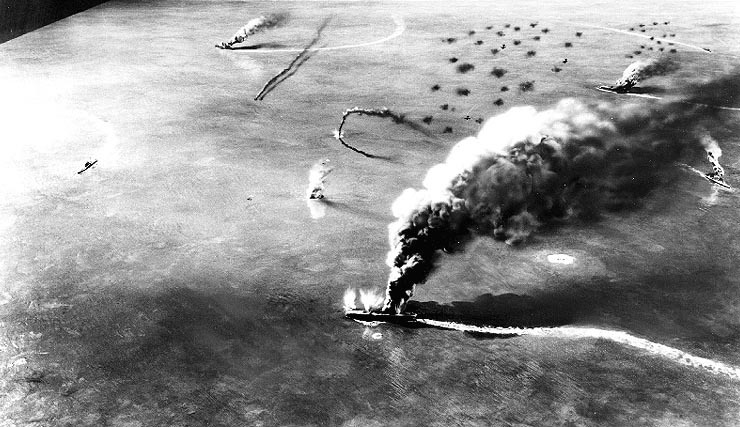 By June of ’42 we had broken the Japanese naval code and knew that they had planned a major assault on Midway. In contrast, Japanese code breakers worked within a much more rigid structure. They could not work independently, but had to take specific direction from superiors at all times. They never achieved any measurable result. All armies have a hierarchy, with orders that require obedience. But different armies allow for more independence from their soldiers than others. As we might expect, Japanese leadership insisted on strict, uniform control of all aspects of the battle. To help achieve this level of control they grouped their air craft carriers all together, ostensibly to prevent free-lancing. But it went both ways, for Japanese soldiers, not having been trained to act independently, could not do so. The Americans, by contrast, spread out their ships. 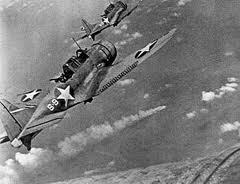 The turning point of the battle came when an American dive-bomber squadron located the carriers (grouped together) they just happened to all be refueling, leaving tons of fuel exposed to attack. The Americans needed only a few direct hits to essentially sink three carriers in six minutes. Again, whatever role you assign to “chance,” it was no coincidence, especially when we consider that dive-bombers found the carriers when the squadron leader made a “best guess” of his own, and did not act on any specific order. The military culture of the American army had some distinct differences from that of the Japanese, and this difference emanated from the society at large. When the Japanese carriers were hit, all of the Japanese admirals and captains gathered below deck to commit ritual suicide. This action emanated directly from their code of “Bushido,” which penalizes failure and dishonor with death. We can contrast this with General MacArthur of the U.S., who, when he suffered defeat and humiliation in the Philippines in 1942, fled the scene. In 1944 he came back to liberate it. Most historians I have come across argue that Japanese Generals and Admirals were at least the equal, if not superior, to their Allied counterparts. Japanese privates had just as much, if not more, fighting spirit as the Americans. All agree that the real difference between the armies could be found in their respective sergeants, lieutenants, and captains. Allied soldiers of this rank could lead and adapt to changing conditions on their own, and their Japanese counterparts could not. Interestingly, Hitler also had an obsession with “honorable” suicide, though few of his generals took him up on the idea. Rommel eventually ignored Hitler’s “Victory or Death” order at El Alamein, though he later regretted he did not disobey even earlier than he did, for Montgomery’s artillery inflicted so much damage the Nazi’s never recovered in Africa. A common theme running through all these factors is the honor given to individual life, something that totalitarian societies do not value. In the end, such values not only don’t help your society, they don’t help your military either. Of course our discussion then moves toward defining “democracy,” which, for as much we use the word, proves more difficult than we might expect. “Democracy” is a “good” word, and “empire’ is one of those words you cannot say on TV. But empires had many things that proponents of democracy value, such as religious tolerance and ethnic mixing. This universality gave early democratic movements their enormous power and enabled them to move speedily through Europe. But this is not the whole story, for coupled with this universality came the rise of nationalism. How do we reconcile these different forces? The French had a hard time of it, rallying to defense of the “patrie” against Austria and Prussia and then expanding under Napoleon both to spread their universal ideals and rule others in the name of France. The recent presidential election showed this tension. It has been with us for a while. On the one hand, democracy thrives on the idea of self-determination. Democracy grants people the right to determine our lives because we share common interests, cultures, goals, etc. Modern democratic movements have their genesis in rebelling against rulers who do not share our culture our goals, those that do not speak for us. On the other hand . . . democracy believes in equality for individuals as well as groups, and this equality, applied in a heterogeneous culture, must in turn limit some aspects of self-determination for the state to hold together. This has led some to speculate that increased diversity can contribute to more autocracy. Of course nationalism can also be used to exclude and eliminate others, but this is rare. These rare occasions are however often used to discredit nationalism. An elite who doesn’t have the best interest of the people at heart, but which does want all the benefits of a high social position often tries to promote patriotism instead, and at the same time downgrades nationalism. Patriotism is simply to owe allegiance to the state even if that state is not legitimized by the people. The state is in that perspective merely an organisation like any other. If that were true it would be like asking soldiers to die for the telephone company. Without identification and an emotional bond between people and state we would have no alternative then to live under a police state. If we don’t want a police state then we need some degree of nationalism. If you have multiple cultures present in the same location who each have different rules on how to order the world then there needs to be another ethical system to mediate between them. For example, Muslims have Sharia law which describes how a good Islamic society should be organised. These laws are not accepted by non-Muslims for if they would accept them they would be Muslim as well. In a truly multicultural society the Sharia law would govern the lives of Muslims and each of the other cultures would have their own laws as well. Now Germany, as with other European nations, has a culture based on Christianity and the Enlightenment, which values ideas like freedom, equality and self-determination. If you implement multiculturalism then the values of the Enlightenment are degraded to the level of only being appropriate to the ethnic German population. You would get a Germany where each (ethnic) community has its own rules. Of course such a system could never work in a modern society because people are not isolated in small communities. Multiculturalism can however also be used to invalidate all of the cultures present, because if all cultures are equal, which multiculturalism implicitly states, than none may rule over the other. This means that, in the case of Germany, the mere presence of another culture is already reason enough to replace German culture with something else. This ‘new’ culture is by definition anti-democratic, because it is one of a small elite who appoints itself as mediator between the various cultural groups. In this way an elite rules over a set of distinct peoples. In that sense multiculturalism is a leap backward in time when there were large empires ruled by a small nobility and people’s positions in society were fixed by birth. Characteristics of such empires are that they are fiercely anti-democratic, oppressive and unable to compete economically in a globalised world. As much as we might wish, we cannot work out either ideas of liberty and equality in a vacuum. Something somewhere has to give. It appears that those who lean towards the multi-ethnic, tolerant, and globalized side of democracy must tolerate some degree of nationalism for the support structure of multi-ethnic tolerant societies to exist. The balance will be hard to find. On what side should the Church fall? Here we must take great care to avoid identifying too much with either camp. The first half of the 20th century gave us the disasters of nationalism, and more recently, we see the problems created by multiculturalism. All the more reason for the Church to create its own culture . . .